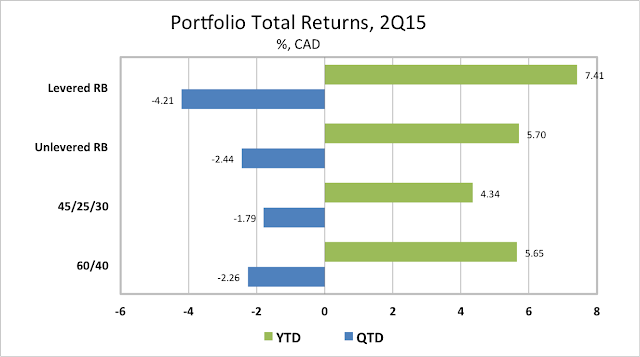 Global ETF portfolios for Canadian investors gave back a lot of their first quarter gains in 2Q15. The weaker performance was partly attributable to a 1.6% appreciation of the Canadian dollar relative to the USD that reduced C$ returns for Canadian investors in USD denominated global ETFs. The forecast for global growth in 2015 continued to be revised down. Global real GDP growth in 1Q15 fell to its weakest pace since the 2008-09 global recession. Four of the eleven large economies that I track contracted in 1Q15, including US, Canada, Brazil and Russia. The US is on track for a moderate growth rebound in 2Q15, but the other three economies are still contracting. Following decent starts to the year, Eurozone and Japan growth moderated in 2Q15. Crude oil prices stabilized and posted a modest recovery, supporting the currencies of oil exporting countries, including Canada. Inflation forecasts stabilized in 2Q15 as oil prices recovered and deflation worries eased. Despite the US Fed still signalling that it intends to begin raising the policy rate this year, global central banks continued to ease policy. China, Korea, Australia and Russia cut their policy rates in 2Q15. Brazil was again forced to hike policy rates to support its currency. After falling virtually everywhere in 1Q15, bond yields reversed course and rose virtually everywhere in 2Q. In the final weeks of 2Q, after surging into bubble territory, China's equity market entered a sharp correction, falling by over 20% from its highs. In the final days of 2Q, negotiations between Greece and its official creditors broke down and Greece defaulted on a 1.6 billion Euro payment to the IMF. As 3Q begins, with Greek banks closed, capital controls looming, and a referendum planned for July 6, the situation remains fluid. Despite reduced growth prospects and below target inflation, the Fed continued to stress the need for "policy normalization". In late June, New York Fed President William Dudley said that a September rate hike is still very much in play. Importantly, the Fed continues to signal that the normalization of rates will be gradual and dependent on incoming economic data. This caution has taken some of the steam out of the US dollar appreciation. The Bank of Canada failed to follow up on a January rate cut with additional easing, judging that the negative shock to growth and inflation from weaker crude oil prices was faster but not larger than anticipated. This judgement was challenged by the June 30 release of April real GDP data showing a fourth consecutive monthly decline and rekindling speculation that another easing move is needed. The Canadian dollar, which had firmed versus the USD on moderately higher crude oil prices, was weakening again as 2Q came to a close. In 2Q15, with crude oil prices recovering and the USD weakening 1.6% against the CAD, the best global ETF returns for Canadian investors were in commodity and Japanese equity ETFs. The worst returns, driven by rising bond yields, were in US government and investment grade corporate bonds and Eurozone equities. 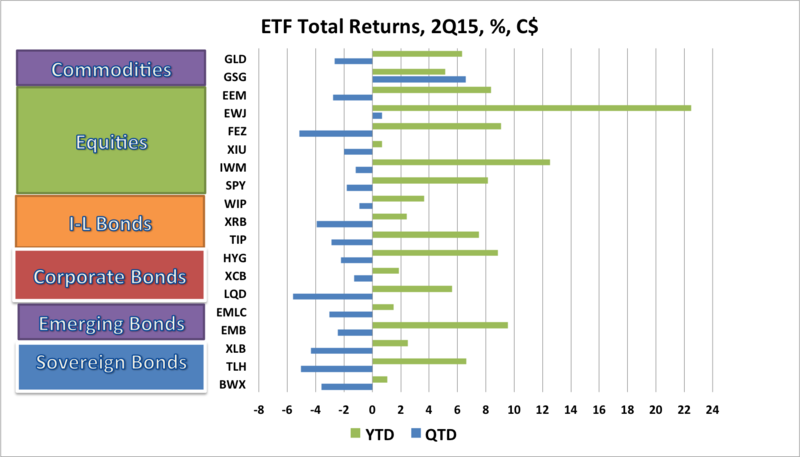 The chart below shows 2Q15 and year-to-date returns, including reinvested dividends, for the ETFs tracked in this blog, in CAD terms. In CAD terms, 17 of 19 ETFs posted losses, while just 2 posted a gain. The gains were in the commodity ETF (GSG), which returned 6.6%, and the Japanese equity ETF (EWJ), which returned 0.7% in CAD. The worst losses were in US Investment Grade bonds (LQD) -5.6%; US 10-year Bonds (TLH) -5.1%; and the Eurozone equity ETF (FEZ) -5.1%. Canadian ETFs performed poorly in 2Q15. The Long Bond ETF (XLB) returned -4.4%; the Real Return bond (XRB) -3.9%; the Corporate bond (XCB) -1.3%; and Canadian equities (XIU) -2.0%. In 2Q15, the Canadian ETF portfolios tracked in this blog all posted negative returns in CAD terms when USD currency exposure was left unhedged. When USD exposure was hedged, the portfolios generated flat to modestly positive returns. In a November post, we explained why we prefer to leave USD currency exposure unhedged in our ETF portfolios. The traditional Canadian 60% Equity/40% Bond ETF Portfolio lost 2.3% in CAD when USD exposure was left unhedged, but just lost just 1.6% if the USD exposure was hedged. A less volatile portfolio for cautious investors, the 45/25/30, comprised of 45% global equities, 25% government and corporate bonds and 30% cash, lost 1.8% if unhedged, but lost just 1.0% if USD hedged. Risk balanced portfolios underperformed in 2Q15. A Levered Global Risk Balanced (RB) Portfolio, which uses leverage to balance the expected risk contribution from the Global Market ETFs, lost 4.2% in CAD terms if USD-unhedged, but lost just 2.5% if USD-hedged. An Unlevered Global Risk Balanced (RB) Portfolio, which has less exposure to government bonds, ILBs and commodities but more exposure to corporate credit, lost 2.4% if USD-unhedged, but just 1.3% if USD-hedged. Despite their 2Q15 losses, all of the global ETF portfolios retain decent gains for the year-to-date, ranging from a high of 7.4% for the Levered Risk Balanced Portfolio to a low of 4.3% for the conservative 45/25/30 portfolio. The weak 2Q15 performance of the unhedged global ETF portfolios was been driven by two factors: the rise in bond yields as US economic data firmed and the Fed continued to tilt toward tightening; and the modest rebound of the CAD versus USD as the price of crude oil recovered. Both of these moves represented partial reversals of trends that generated strong 1Q15 returns (in CAD terms) for our global ETF portfolios. It is interesting question as to whether the 2Q15 reversals have run their course or will continue. In its June Oil Market Report, the International Energy Agency noted that preliminary data indicate that crude oil inventory builds continued into the second quarter. Global supply and demand balances suggest that the pace of builds is not expected to slow until 3Q15 when supply growth is projected to be reined in. Crude oil inventories remain near record levels and oil production continues to run ahead of demand. 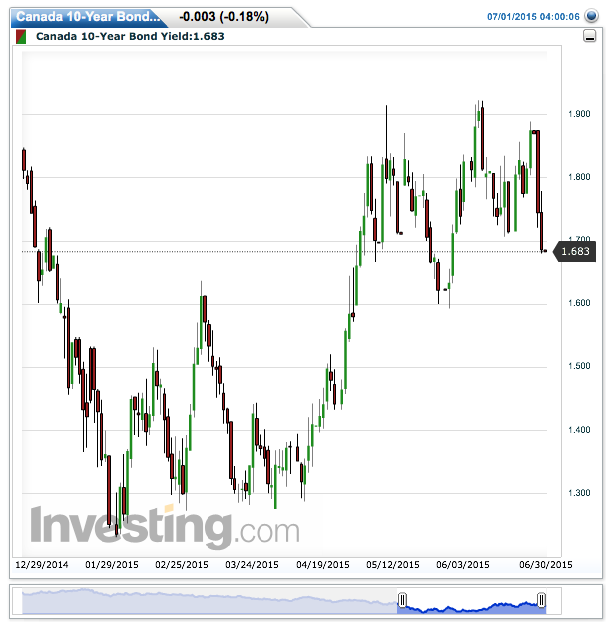 The market also has been awaiting the outcome of the Iran nuclear negotiations ahead of a missed June 30 deadline that has now been extended. An agreement could put 1 million barrels of Iranian crude back on the market, but failure would spark renewed tensions. Fed and BoC policy continue to tilt in opposite directions. In both countries, real GDP contracted in 1Q15. While US economic data has firmed in 2Q, Canada has continued to stumble as the negative effects of lower crude oil prices continue to weigh on economic activity. While the Fed has remained steadfast that policy rate normalization will begin later this year, the BoC has taken a wait-and-see approach since cutting its policy rate in January. The US economy remains better positioned than Canada for a 2H15 rebound and influential members of the FOMC continue to signal the possibility of a rate hike as soon as September. Three months ago, I said "If growth disappoints in both countries as 2Q unfolds, however, it is likely that the Fed response will just be to delay tightening, while the BoC response will be to cut rates again." As 3Q15 begins, that seems to be the scenario that is playing out. For that reason, maintaining unhedged exposure to global ETFs remains my preferred portfolio stance. The more conservative 45/25/30 portfolio (which I have favoured) incurred smaller losses in 2Q15 than the more aggressive 60/40 and Risk Balaced portfolios. As we enter 3Q15 in a continuing uncertain environment, characterized by sluggish global growth and divergent central bank policies, and with rich valuations for US equities, remaining well diversified with an ample cash position continues to be a prudent strategy.